Google today updated Gmail for Android, adding a vacation responder, attachment support for all file types, and printing on Android 4.4 KitKat. You can download the new version now directly from Google Play. The vacation responder is rather timely, given that it’s right before the holiday season. If you forgot to set or update your message before leaving the house for the next few weeks, this one is for you. 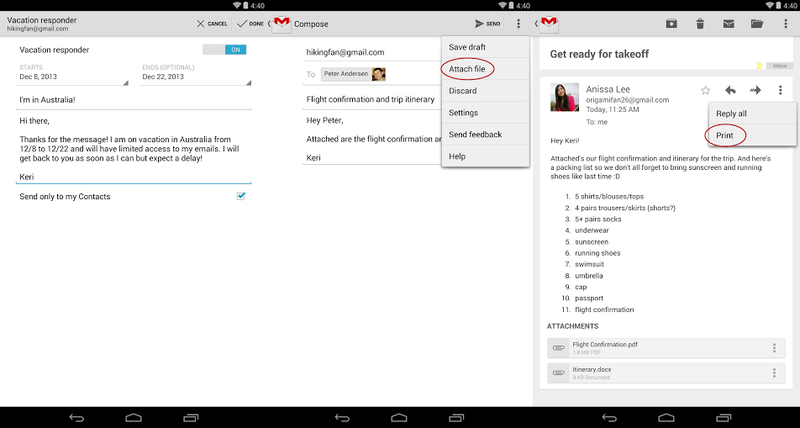 Just create or update your auto responder message right in the Gmail app on Android. In addition to photos and videos, Gmail for Android now supports sending other attachments. These can include documents, PDFs, zip files, and so on. Google says attachments can be “of any type,” though we’re sure some are blocked for security reasons. You can now also print hard copies of your emails. Unfortunately, this feature is only available if you’re using Android 4.4 KitKat, which is only on some 1 percent of devices. Last but not least, Google is promising “enhanced performance” of the app on low memory devices. This is part of Project Svelte, the company’s broader plan to get Android and Android apps using as little resources as possible. Google wouldn’t share when it will bring some of these features to Gmail for iOS, or other mobile platforms for that matter. It’s safe to say that we don’t expect anything new from the Gmail team this year: they deserve a break (pun not implied)!